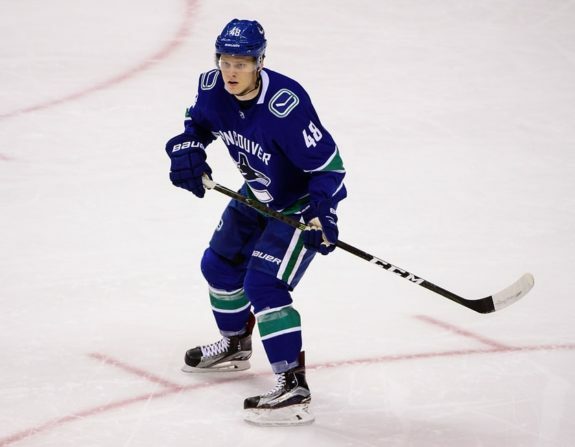 The Vancouver Canucks’ defensive core has been lacking for quite some time, so when the team drafted Olli Juolevi fifth overall in the 2016 NHL Entry Draft, fans were thrilled. The scouting report echoed nothing but promise. However, Juolevi’s somewhat slow development pace has put a lot of people into the skeptics category. Juolevi went to play in Finland for TPS Turku in the SM-liiga and had a slow start, seeing some time on the bench and fuelling certain rumours such as an overindulgence in video games. Jumping to this current 2018-19 campaign with the Utica Comets, the young Finn has come out firing on all cylinders and has shown exactly why the Canucks drafted him so highly. 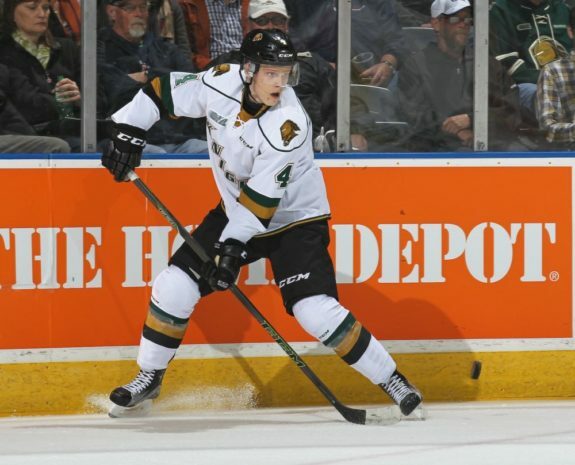 After back-to-back 42-point seasons in the OHL with the London Knights, Juolevi headed home to Finland to further his development under the watch of former Canucks defender Sami Salo. Early in the season with TPS Turku, Juolevi’s production wasn’t exactly high and he was seemingly slipping further and further down the roster. What I feel critics kept forgetting was the fact that he was only 19 years old at the time, making him one of the youngest players on the team and one-of-two 19-year-olds on the team’s back end. Juolevi finished strong and capped the year off at seven goals and 19 points in 38 contests. The team then went into the playoffs and he rattled off seven points in 11 postseason games. Just as soon as people started hopping on the Juolevi-train, things took a turn for the worst. The young man announced he was going under the knife to remove a portion of a herniated disc. He was expected to miss some key training time over the Summer before training camp. It’s important to note that the Canucks see Juolevi as a longterm project and are not going to rush things. He’s a terrific skater with offensive upside and the Comets are the perfect training grounds for the 20-year-old. With the Comets, he’s indisputably the best defender on the roster. With 13 points in 18 games so far, he’s tied for third on the team in scoring but first among D-men, he leads the team in assists with 12 and he’s the highest-scoring defensive rookie in the entirety of the AHL. Through the first leg of the 2018-19 season, Juolevi is showing shades of a complete and well-rounded top-pairing blue-liner. The question is, when will he be ready for some NHL time? The answer is sooner rather than later. Fans will see Juolevi in a Canucks jersey for at least a few games this season. Honestly, I’m a bit surprised it hasn’t happened already considering the injuries that have riddled the Canucks. With Michael Del Zotto’s contract coming to a close at the conclusion of this season, a spot does open up on the Canucks’ blue line, and Juolevi could be a great candidate to fill the void. Juolevi’s development has gone well. Not great, but well. He didn’t come out of the gate hot like a lot of other players in his draft class, but I think he’s right where he should be. The Canucks have played the long game very wisely and the fans are going to begin noticing the dividends. If the young Finn can maintain this level of play for the rest, or at least the majority, of this season, then he will start the 2019-20 season as the Canucks’ sixth or seventh defenceman. What do you think about Juolevi? Should we believe the hype? Let me know in the comments down below!